Sierra Wireless are a pretty unknown name in the UK, and to date most of their products have been industrial, commercial or telecoms based. So the Voq Professional is a bit of a suprise. 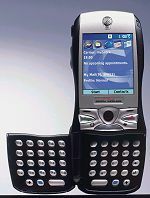 Essentially, the Voq Professional is a combined PDA/mobile running Windows Mobile 2003, which combines the power and familiarity of the Windows operating system in a tiny package. It's a tri-band GSM phone, so it will work pretty much anywhere there's a GSM network, and the Voq supports data transfer over GPRS. 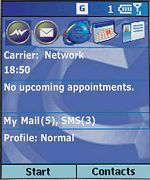 In addition to making phone calls, the Voq Professional supports POP3 and IMAP email, instant messaging through Microsoft MSN Messenger, SMS and MMS. The Voq Professional runs Pocket Internet Explorer and can play back music and video using the built-in Windows Media Player. PDA functions on the Voq Professional are pretty standard for a Windows-based PDA. The Voq connects to a PC using a USB cable and supports all the usual data synchronisation you'd expect. 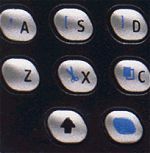 One really special thing about the Voq Professional that stands out from other similar Windows-based PDA/phones is the fold-out QWERTY thumbpad. This is an novel solution to data input which can otherwise be a bit fiddly on PDAs. Underneath, the Voq Professional has a 200MHz Intel XScale processor, 48Mb of Flash memory (20Mb for storage) and 32Mb internal RAM (16Mb for applications). Sierra Wireless haven't specified size, weight and battery life of the Voq Professional as of yet, but it's likely to be slightly larger and heavier than the Orange SPV e100 which is 120x50x23mm and weighs 120g. 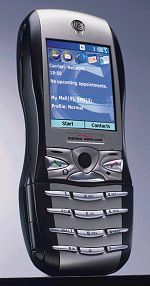 Sierra Wireless are keen to emphasise long battery life, which has always been a weak point in Windows-based mobiles. There's certainly no other phone like the Voq Professional. Maybe it's not quite the perfect hybrid PDA/Phone/music player, but it is certainly getting there! If you want more information on the Voq Professional, subscribe to our mailing list. Also, the Update newsletter contains general news about new phone releases.